Game is going under and honestly I’m not surprised. Here & Here explain just how bad it’s become. I used to work in GAME and I think part of the problem is that they don’t actually offer anything else to the gamer besides videogames. They’re a video game store you cry, what else can they offer?! Well their business model is outdated and was great when they were the only place to go buy games but now things are different. So what’s so wrong? Let’s ignore the fact that gamers are increasingly looking online to get the most for their money, if they did want to get a physical copy supermarkets and other retailers are offering the same service at a much cheaper cost and at times with greater convenience. I mean what does GAME have to offer gamers as an incentive other than a few points? Sure they might get some conversation going with the staff, but that void can easily be (and is) filled with people on an online forum. Assuming the shop assistants are gamers, they don’t often have the luxury of stopping to chat with customers in-depth game mechanics and strategies with a customer, they’re at work. When you look at the bigger picture, it’s hard to see what the incentive then is to go to GAME when a gamer can just pop into Tesco and pick up the latest copy “My Little PEW PEW 4: Revelations” with their shopping? The GAME I worked at doesn’t even have displays anymore, you have to ask to test out a handheld device and then an employee is hovering around your shoulder pointing out it’s key features. I imagine consumers think, “Okay thanks, back off a bit will you so I can actually play with it.” It sucked and I remember the days of going into Argos of all places with my mom and waiting in line patiently to have a go on the N64 display model. It was glorious, I had the console in my hands. I talked with the other kids, it was an experience. Games Workshop is a great example of what GAME should be doing. Everytime I walk into a Games Workshop I can feel that it’s about more than just the selling. On my second visit the assistant asked me if I wanted to play, immediately he tried to engage me in an activity. I sat down for half an hour and he did his best to give me a summary of how it all works. 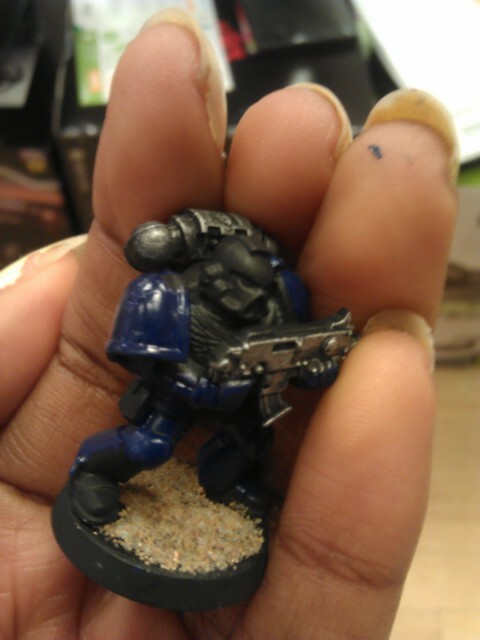 I painted my first character, I was hooked. The prices of the kit are not cheap, they require a lot of investment as do many gaming consoles and PC rigs and the level of service reflected that. You see when it comes to a hobby, (and gaming is a hobby) it’s about more than just selling the product. Retailers need to engage the customer. They must connect with them. Get display models out so people can play with them hands on. Run competitions, tournaments, signings, talks with developers. Do you know how cool it would be if I could go to my local GAME and watch E3 or some other gaming event?! Yet nothing like that is available. I’ve been to a midnight launch and all people did was line up and buy the game at midnight. Like, seriously, you waited in line for that? No custume contest, no.. nothing, just line up and buy the game. Make the points card mean something more than just a few quid off there and there and a digital record of your purchases. A great example of a company that heavily invests in their consumers is Valve. They’re online distribution service Steam is doing so well because it offers more than just games. There is a community tab that allows gamers to create groups, chat rooms, plan events, schedule games, announce plans and generally organise themselves. For PC gamers Steam has become a sort of Facebook, a central hub to keep a track of your gaming activities. These sales are met with such anticipation, and the gamers know that they may not play all these games, but the deals are so good and the activities are so engaging. Yes it’s a play for our money but they do it while at the same time engaging and giving back to the gamer. This type of discourse is missing from GAME’s approach to selling. And it works out beautifully for the publisher too! Sales can increase by a factor of 40. I look at other single product stores like bookstores, they have to offer more than just books. They have authors come in do reading and signings. Their children’s sections have story times and play times. I’m not surprised GAME is going down the crapper because they don’t offer anything other than just the product. 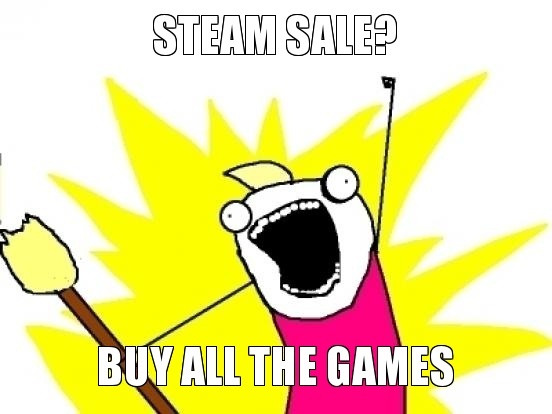 But whatever though, I’m just ready for the next Steam sale, Kingdom of Amalur: Reckoning will go down in price right? Next Post Oh just retail.